It’s no secret - HubSpot is one of the preferred tools used by marketing and business development teams globally. HubSpot’s mission is to make inbound marketing accessible to everyone. Keeping true to its mission, HubSpot recently launched a new package within its Marketing Hub suite - The Marketing Starter Plan - and we believe this plan is going to shake up the marketing world. HubSpot has designed this new package keeping in mind the needs and ambitions of small businesses. It now offers an affordable alternative to other solutions available in the market. “Historically, small businesses looking for an economical way to get started with marketing have had to cobble together disparate point solutions to perform tasks like sending emails and targeting ads. Unfortunately, what they save in dollars they often lose in time spent trying to connect and manage all of those systems. Marketing Hub Starter gives growing marketing teams the tools they need to get started in one easy to use platform, without the enterprise software price tag. So what’s in store with this package? Here are the features you can experiment with as part of the Marketing Starter Plan. Email Marketing with 1000 contacts. If you are using MailChimp or similar tools, its time to move to much robust platform. No brainer. Lead analytics dashboard for a comprehensive 360-degree view of all your leads. Forms management including pop up forms, external form tracking and native forms. Contact management and activity with list segmentation based on various properties, email activities and form submissions. In addition to these, you also get phone and email support, email marketing and mobile optimisation. Also, you can remove HubSpot branding. The Marketing Starter Plan starts at $50/month with the ability to increase the number of contacts for an additional price. Right now, 1,000 contacts are included in the package. Should you opt for the new Marketing Starter Plan? With the introduction of this new plan (the other plans are Free, Basic @ $200/month, Pro @ $800/month and Enterprise @ $2,400/month), the question we are asking is, who is this plan best suited for and whether it is worth the investment. Along with small businesses, a lot of price-sensitive individual professionals like accountants and lawyers who want economical solutions can now access this world-class platform, with more extended functionalities than those available in HubSpot’s Free Marketing Plan. With powerful engagement and nurturing features, HubSpot’s Marketing Starter Plan will make it possible for marketing based on intelligent insights to be available at the fingertips of anyone who conducts any kind of business. HubSpot’s new Marketing Starter Plan is now available to that segment of individuals and small business owners who come with limited budgets. They would previously have to contend with the Free Plan which may have placed restrictions on the data and insights available for smart marketing. Now, however, with this economic plan, not only do they get a chance to scale their business faster, it opens up the market for other marketing automation vendors who were offering lower price products with limited functionality, as these vendors will have to embrace this change if they want to continue to remain competitive, and come up with similar products or propositions. HubSpot has been providing the building blocks for businesses to analyse and optimise their marketing and sales efforts. With this new Marketing Starter Plan, HubSpot has now tapped into yet another segment of businesses, the one composed of individual professionals and freelancers. 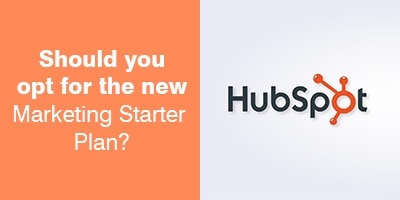 Our verdict - HubSpot’s new Marketing Starter Plan will be a game changer.